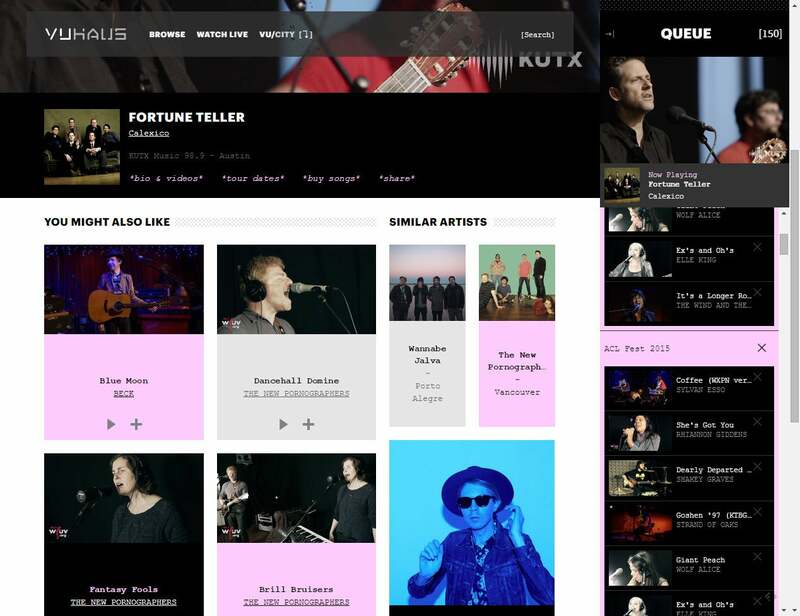 Fans of public radio know it’s a fabulous resource for discovering new music, with many shows featuring artist interviews and live performances. 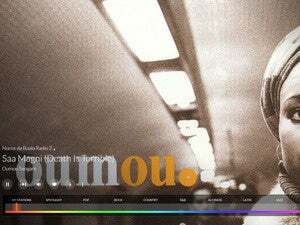 Many stations also make efforts to discover and promote new local artists. What you might not know is that many of those performances are not only recorded live but also captured on video. A coalition of public radio stations has pooled their archives at the new website VuHaus to bring these performances to a worldwide audience. Primary partner stations include KCRW (Los Angeles), KEXP (Seattle), WFUV (New York), WXPN (Philadelphia), KUTX (Austin), and KTBG (Kansas City). The site officially launched today at 10AM Pacific and will feature performances from James McMurtry, Shelby Lynne, and Best Coast live-streamed from the Non-Comm concert series in Philadelphia, sponsored by WXPN, beginning at 5PM Pacific. That lineup is a pretty good indicator of what you’ll find in the rest of the VuHaus library, which leans heavily toward indie, folk, Americana, alt-rock, and singer-songwriter performances. Think Jeff Tweedy, Calexico, Brandi Carlile, Interpol, Spoon, Old-97’s, David Gray, Sonny Landreth, Eels, Chuck Prophet, Lucinda Williams, and similar artists. If you’re looking for the Top 40, pop, or hip-hop, you’ll be disappointed. World music is also lacking here; classical is non-existent. VuHaus is stuffed with great live-performance videos, but the vast majority of its featured artists come from the same genres. In addition to live-in-the-studio performances, you’ll also find a number of concert performances from notable music festivals such as SXSW and Bonnaroo. Videos stream at resolutions up to 1080p (encoded with H.264), but the audio resolution isn’t nearly as good (a bit rate of 128Kbps at a sampling rate of 44.1kHz). This isn’t a site for critical listening, but that’s not really the objective. If you’re watching the videos in the main window (versus full screen), you’ll find a link to a biographical sketch of the artist, a link to the Bandsintown website listing upcoming tour dates (and links to ticket agencies), a link to the iTunes store where you can purchase and download the artist’s music, and links to social-sharing sites including Facebook and Twitter. A column on the righthand side of the page queues other video performances by the same artist, followed by suggestions for other performers in a similar vein. These auto-play in a small window, but switch to the main window when you click them (you can expand them to full-screen from either window). VuHaus is shaping up to be a terrific free resource for music fans looking to discover new artists (provided you’re into the somewhat narrow types of music its stations are focusing on). 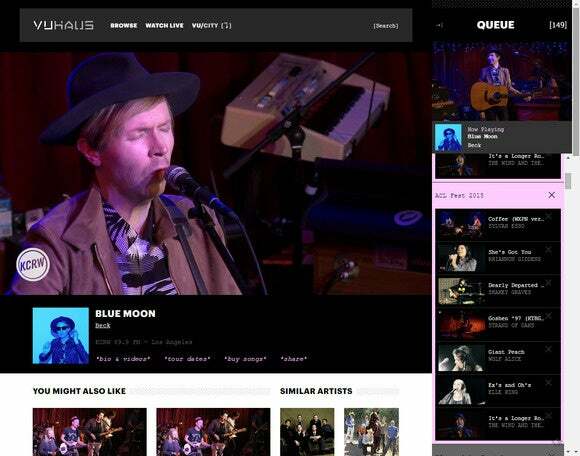 The site offers just a few videos from each artist (I counted just one from Beck), but there are hundreds to choose from and library should continue to grow. The service is completely free, being funded through philanthropic support—including from the Corporation for Public Broadcasting—and “a select number of sponsors,” according to my PR contact. I didn’t encounter any ads while checking out the service. Give VuHaus a listen and let us know what you think in the comments section, below.